Nigerian Prophet TB Joshua revealed on Sunday that late president of Malawi Bingu Wa Mutharika knew that his prophecy of the death of and of elderly African Head of State was talking about him. 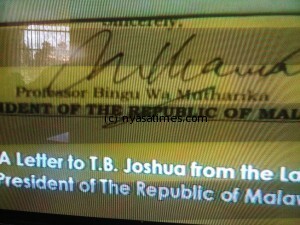 Speaking during a Sunday service broadcasted live on his Emmanuel Television, TB Joshua also displayed the letter written by President Mutharika to him. President Mutharika died on Thursday after a sudden cardiac arrest. The prophecy was first made on 18th March 2012 and repeated on April 1. Nyasa Times reported about the prophecy but the President downplayed it when he told Malawians religious leaders that he will not die because a person wished so. A cabinet minister Yunus Mussa nonetheless did not take the prophecy lightly as he offered a animal sacrifice to ensure it did not pass. The Nigerian Prophet informed the packed church and millions of viewers following the service via Television that when prophecy is made the one talked about always knows. “Last week on Sunday I told you I see the close Thursday,” said TB Joshua. The prophet told the service that God shows him a lot of things and he only tells people what they are suppose to hear. “When a prophet says I can see death he is simply telling you to put your house in order,” he said. TB Joshua could not disclose the content of the letter saying it was personal but just showed the top reflecting whom it was addressed to and the bottom showing the sender. He explained that Mutharika knew that his days of living were numbered and that her had answered God’s call and was now resting. He prayed for the people of Malawi to forge ahead under the leadership of President Joyce Banda who has been visiting the Prophet in Nigeria. MMD to scrutinize Mutati’s role in parliament.